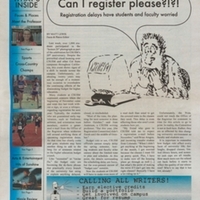 Sports are the feature of this issue of the Pride (Vol. 22, No. 10). The women's cross-country takes the NAIA National Championship. 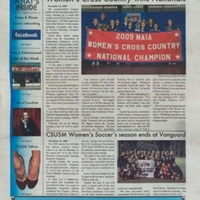 Men's cross-country and women's soccer are also reported. 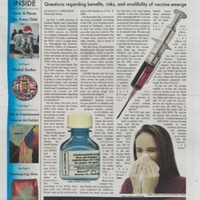 Additional articles look at study abroad programs. Vol. 22, No. 8 looks at the budget impact on delayed registration for Spring, the drinking age debate, and an interview with Professor Heidi Breuer. Vol, 22, No. 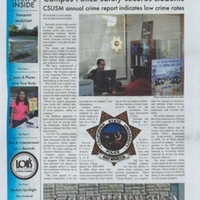 7 reports on a variety of topics including the latest campus safety report, Love Your Body event as part of student health, the privatization of education, and the Tea Party Express. Vol. 22, No. 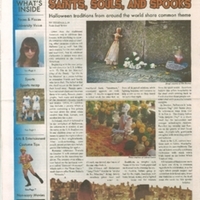 6 focused on Halloween folklore, customs, and activities. The impact of the instructional furlough due to budget cuts is covered. Cross-country and soccer successes are announced. Vol. 22, No. 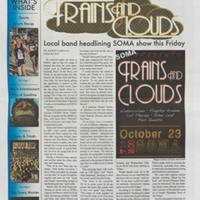 5 covers local entertainment, seasonal employment, and continued protest over the effects of budget cuts on student success with a look at AB656. Vol, 22, No. 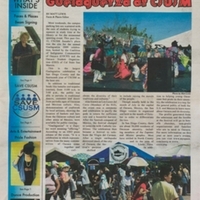 4 carries stories on the annual Guelaguetza celebration, the beam signing for the Social and Behavioral Sciences Building (SBSB), and the creation of the student action group, SAVE CSUSM in reaction to the budget cuts. 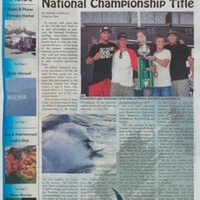 The CSUSM Surf Team's win of the national championship is front-page news, followed by stories on the new weekly Farmer's Market in Lot C, a lecture on indigenous plants for VPA 311, and the Field House gym facilities. Vol. 22, No. 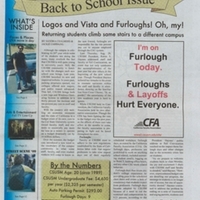 2 continues coverage on the impact the furlough has on course availability. 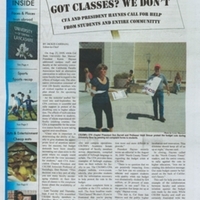 Other articles look at low unemployment rates, campus sports, and local eateries.